Elizabeth and Alfred Kay bequested their Hidden River Farm to Chester Township for public use. The Kay Center consists of 858 acres, of which 80 acres are meadow habitat maintained by mowing and prescribed burning. The fields feature goldenrods, little bluestem and other native species. The Kay Center is home to the New Jersey Office of the Nature Conservancy. The trails, except for the Green Trail, follow wide gravel paths with easy footing. The Green Trail is a forest trail that can be rocky and uneven with short steep elevation changes. There is little elevation gain in the trails in the forest and meadow around the visitors center and parking lot; more elevation gain on the northern and western sections along the Black River. The trails traverse forest, field and river landscapes. The challenging way to see the river is to follow the Green Trail on the east bank; the easier way is to follow the Orange Trail on the west bank. The trail starts 0.1 mile north of the parking lot off the Blue Spur, goes through forest to connect twice with Yellow Trail, and affords the opportunity for the shortest loop hike around the Center. The path travels a loop connecting the Orange Trail and Patriots Path. Starting 800 feet from the Orange Trail origin near the entrance road, the trail traverses a meadow, crosses the White Trail junction in 800 feet, then enters the woods. It briefly intersects the Patriots Path and then loops back south, past old stone ruins and the White Trail junction, ending back at the Orange Trail. The Orange Trail travels through all the ecosystems – meadow, forest, and river gorge - on easy footing. There is little elevation change around the Center, more elevation changes closer to the Gorge. Starting 600 feet south of the parking area on the Patriots Path, the Orange Trail traverses the meadow, passes a Yellow Trail junction in 800 feet, then enters forest and passes a second junction with the Yellow Trail in 0.35 mile. The trail then descends, passes a junction with the Red Trail on left at 0.55 mile and continues downhill until a junction with the Patriots Path at .85 mile. Here the trail turns left downhill (as the Patriots Path continues straight), crosses the Green Trail in a few yards and reaches the Black River at 1 mile. The trail divides here: turning left, it is co-blazed with the Green Trail and follows the eastern shore of the River on a wide gravel path for 500 feet, then turns sharply left uphill and in a few yards ends at a junction with the Green Trail. A few yards beyond this turn is an excellent view of one of the river cascades. 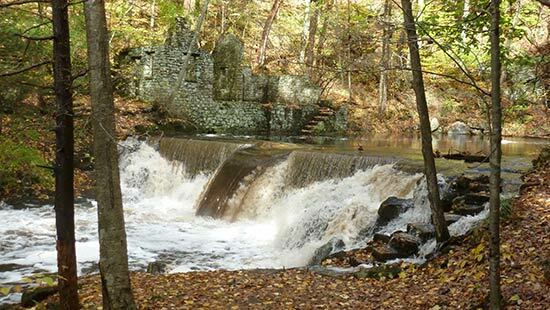 Turning back, the Trail crosses the River on a wide wooden bridge and follows a well-graded woods road to the right and uphill, curving around to meet the River again, ending at the ruins of the stone cottage, dam and swimming hole.